A new technology from Mitsubishi will make large ships more fuel efficient by using tiny air bubbles to reduce the friction of the ship’s hull on the water. The company has completed the conceptual design of the MALS-14000CS cargo ship that will use the proprietary Mitsubishi Air Lubrication System (MALS). The conceptual design pairs MALS with other state of the art emissions reductions technology totaling an overall emissions reduction of 35%. MALS reduces friction by supplying air to the vessel’s underside therefore creating a layer of tiny bubbles that allow the ship to glide with less friction between the hull and the seawater below. The MALS technology alone reduces emissions by 10% but Mitsubishi researchers have paired it with a new über efficient hull design, an electronically controlled diesel engine, a waste heat recovery system and a new two-engine, two-shaft propulsion system that bring total emissions reductions to 35%. 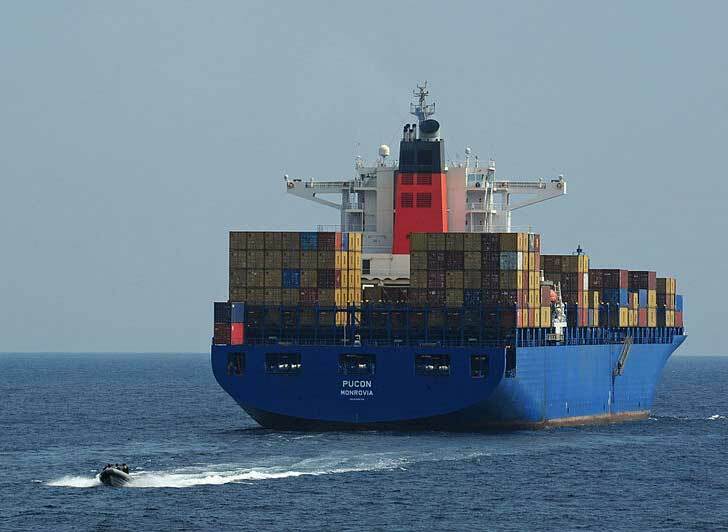 The emissions reductions are based on Mitsubishi’s concept vessel, the giant MALS-14000CS, a New Panamax 2 size 14,000 TEU*3 (twenty-foot equivalent unit) container vessel capable of carrying hundreds of 20-foot long shipping containers. In addition to using the technology in newly designed ships, MALS can be incorporated into existing ships making them more fuel efficient. Mitsubishi’s test vessel is a module carrier, a type of large ship with a wide, shallow-draft hull which creates low water pressure making it possible to pump air below the vessel without the need of too much electricity for air pump devices. In addition, the vessel’s hull is wide and readily retains the water bubbles without letting them slip away making it a perfect test vessel for the technology. The technology’s development has been sponsored in part by Japan’s Ministry of Land, Infrastructure, Transport and Tourism’s “Support for Technology Development from Marine Vessels for Curtailing CO2”. Interesting that the Japanese government is involved in the development of the technology (for a clearly non-military ship). Those commies... When is the US going to realize that good things can happen when promising technology can be nurtured by government investment, and that it's not always better to let something sit idle until the profit motive is great enough. By then, someone else has it and you're playing catch-up ball, or paying them for it. I'd rather have government spending on those kinds of national priorities than pouring it down the holes of dishonest bankers and military contractors. If it's a "14000 TEU*3" vessel, then surely that means it's capable of carrying THOUSANDS of SIXTY-foot containers? Fourteen thousand to be exact? Rather than hundreds of twenty-footers? The latter is more the apparent capacity of the freight trains that keep going by my window and I'd be quite disappointed if a supermassive container-ship could only hold one train's-worth. That's more the capacity of a Ro-Ro ferry... This is very interesting however. I'm intrigued to how this can work without causing the ship to sink, as frothy, bubbly waters are sometimes implicated in mysterious sinkings (the ship is then trying to remain buoyant on air, rather than water, which fails to work). I mean, work it must, otherwise this wouldn't have gotten through the preliminary modelling stages... but how? A new technology from Mitsubishi will make large ships more fuel efficient by using tiny air bubbles to reduce the friction of the ship's hull on the water. The company has completed the conceptual design of the MALS-14000CS cargo ship that will use the proprietary Mitsubishi Air Lubrication System (MALS). The conceptual design pairs MALS with other state of the art emissions reductions technology totaling an overall emissions reduction of 35%. 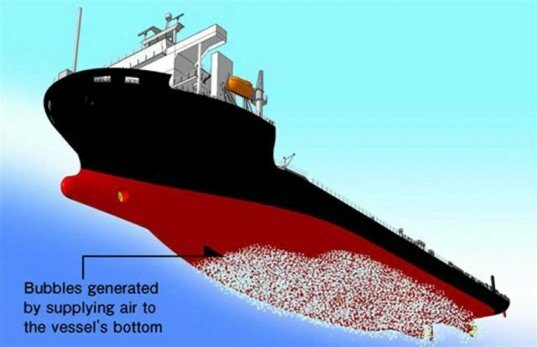 MALS reduces friction by supplying air to the vessel's underside therefore creating a layer of tiny bubbles that allow the ship to glide with less friction between the hull and the seawater below.